Space will undoubtedly be in limited supply in many of the world’s major cities over the next few decades. While Delhi had 22 million inhabitants in 2010, that figure is set to rise to 36 million by 2050, according to figures from the Institute of Technology at the University of Ontario. Over the same period, the population of Mumbai is forecast to rise from 19 to 42 million and the population of Cairo from 17 million to 24 million. Whereas almost half of the world’s population now lives in cities, more than two thirds will be urban dwellers by 2050, according to estimates from the United Nations. In the final analysis, large cities provide more jobs, offer a higher standard of living and easier access to education and health care. The construction industry across the globe is reaping the long-term benefits of increasing urbanization. Whether it is construction in the residential, commercial and industrial segments or expanding the transport and education infrastructure, the growth of these large cities offers good prospects for construction companies. With average life expectancy continuing to rise, existing buildings need to be modified to meet the needs of an aging population. Suppliers of special vehicles such as concrete mixers, compact loaders or excavators relish these developments. Construction sites, however, also produce noise and exhaust emissions, with legislators and local authorities worldwide increasingly taking action to combat this problem. “Whenever construction projects are put out to tender nowadays, the level of CO2 emissions is increasingly among the selection criteria”, explains Gerhard Stempfer, ZF expert in electromobility in Industrial Technology. One logical approach here is to promote electromobility with zero local emissions on construction sites too. Avoiding the use of diesel eliminates exhaust emissions. And it also reduces noise levels. estimated construction industry sales in the United States in 2020 alone. At the Bauma trade fair in Munich, ZF recently presented electromechanical drive systems designed specifically for construction machinery. Compact construction machinery as well as special vehicles in the truck segment, such as concrete mixer trucks, offer lots of potential. More stringent restrictions will initially come into effect in this segment. ZF solutions leverage synergies derived from the Group’s wide-ranging product portfolio. The electric concrete mixer truck presented at Bauma, for instance, is based on the AVE 130 electric drive, which ZF originally developed for buses . 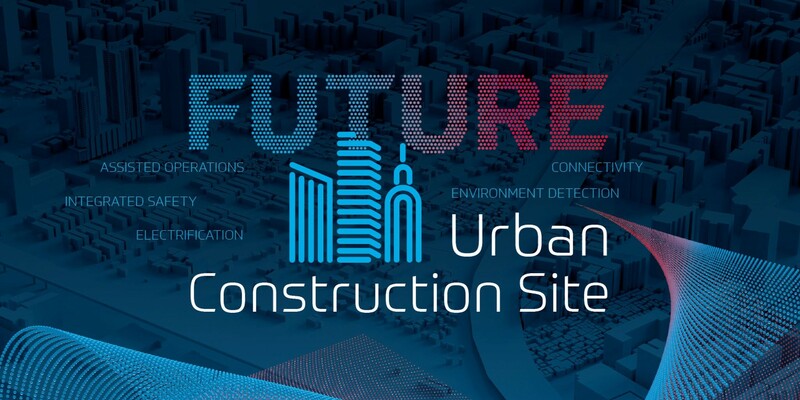 The challenges facing the construction site of the future are manifold. ZF has the appropriate solutions. Lower operating and maintenance costs offset the higher purchase price of this kind of electric unit. Apart from cost-effectiveness and zero emissions, lower noise emissions are also important in many urban applications. Electric construction machinery generates less noise than diesel-powered vehicles. “That means companies can make better use of their machinery at night or in particularly noise-sensitive areas – such as near hospitals”, says Stempfer. Apart from electrifying construction machinery, construction sites worldwide are witnessing another development. “In five years’ time, we assume that all the machinery on the site will be connected to each other”, says Dr. Christian Reischl. He is responsible for "Connectivity" in the Off-Highway Business Unit at ZF. While that may be a welcome prospect, the German construction industry in particular is lagging behind when it comes to digitalization. Paradoxically it is the buoyant economy that is responsible. Because construction companies are busy working their way through their full order books, they spend too little time thinking about investing in forward-looking technologies. “It now makes more sense than ever to do precisely that”, says Reischl. To differentiate themselves consistently from the competition, construction companies must ultimately work as efficiently as possible. Digitalization and connectivity of construction machinery increases the availability and the efficiency of the vehicles used. An open telematics solution, similar to the one offered by ZF with Openmatics , helps deliver this improvement. Its diverse applications provide construction companies with effective fleet management. Logistic chains can also be managed using Bluetooth tags to improve planning and ensure that each individual project step follows the next seamlessly. Smart tags can also automatically record machinery operating hours. In that way, necessary maintenance can be planned predictively to prevent any breakdowns. The current trend is about integrating existing solutions – from manufacturers, service providers and suppliers – into cloud services. “In the long run, our objective is to optimize entire process chains”, says Reischl. Vehicles or machinery must communicate with each other to improve efficiency. One typical example on the construction site would be automated material delivery. That way, the excavator could automatically order the concrete mixer truck as soon as a trench was ready to be filled with concrete. Yet digitalization of the construction site also opens up many more potential applications: “Today we see fully autonomous vehicles being used in the mining sector and we will also experience automated and autonomous driving for certain applications on construction sites before we get to that stage with traffic on public roads”, says Reischl. After all, construction sites are cordoned-off, clearly demarcated areas. As such, an AI control box like the ZF ProAI RoboThink needs to handle a much more limited range of potential situations. Another development on the construction site of the future is the increased use of sensors in construction vehicles and construction machinery primarily to identify and protect people in hazardous areas, but also to prevent vehicles from colliding. In Germany alone, there are more than 100,000 accidents on construction sites every year; special vehicles such as wheel loaders, bulldozers and rollers are involved in one out of nine accidents. The blind spot plays a crucial role here. Cameras on the outside and monitors in the cockpit on their own would not solve the problem. Drivers tend to be so focused on the job at hand that they fail to spot other workers in the hazard zone, regardless of whether in reality or on the monitor. The use of autonomous construction machinery with the necessary sensors will substantially increase safety on the construction site. Here ZF incorporates the know-how from its various business units. Engineers from the Industrial Technology, Electronics & ADAS, Active Safety Systems and Commercial Vehicle Technology Divisions are working together to come up with a conceptual design for autonomous construction vehicles. Further information on the ZF booth at the Bauma trade fair can be found here .